Founded in 1889 in the UK by vet surgeon John Boyd Dunlop who invented the pneumatic tire, Dunlop Rubber entered the Asian market through the establishment of The Dunlop Rubber Far East Co Ltd (incorporated in HK in 1909 but dissolved in 1918). The firm entered the China market in the early 1910s and in 1921, Dunlop Rubber Co (China) Ltd was established in Shanghai. While its primary business was manufacturing of rubber tires for bicycles and automobiles, it also had a sizeable business making rubber shoes (boots and tennis shoes)starting in the 1920s with its Dunlop footwear factory in Liverpool being the largest in the world in the 1930s with many cutting-edge innovations. In search of low cost production partners, Dunlop signed up with Sik Yuen in Hong Kong in the late 1950s. In the 1950s and 60s, the offices of Sik Yuen were located at Room 86 at Jardine House in Central while its factory was located in Tai KokTsui in Kowloon. According to reports by the Far Eastern Economic Review in 1961, Sik Yuen “turns out approximately 3 million pairs of sports shoes, boots, sandals and other types of rubber footwear annually. Capacity is expected to go up to 6 million pairs annually in the near future. Technical assistance from the British firm (Dunlop) has helped to modernize and streamline production”.That same year (1961), the annual sales of the HK rubber shoe industry was HK$100 mil, 70% of which came from exports. According to Pong who spoke with the Chinese press, only 32% of the industry’s costs were imported (primarily raw materials such as rubber and other chemicals) while majority of the costs were local (mostly labor, other domestically manufactured materials) so there was room for profit expansion. He also emphasized the importance of improving the quality of HK’s products to catch up with the likes of Japan to remain competitive as HK rubber shoes were still viewed as lower end and lower quality. To that end, he and Chau invested heavily in equipment and talent with the assistance of Dunlop and by 1962, buyers from the US expressed interests in its products, citing that its quality was superior to some of the Japanese products. 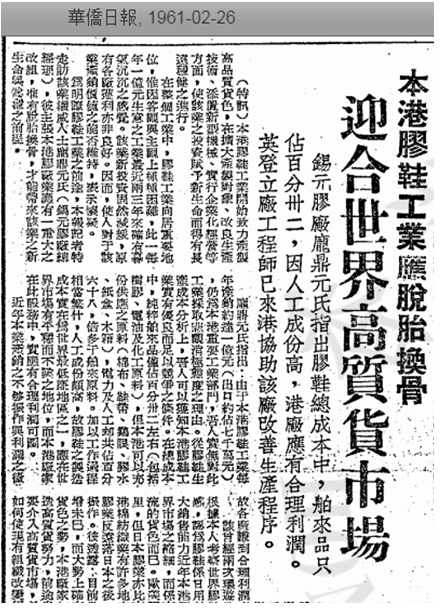 At the time, the US represented less than 10 percent of HK’s total rubber shoes output and Sik Yuen were selling shoes at US$0.50 a pair. In January 1963, Guy Bassett Smith, director and general manager of Dunlop Footwear, visited Hong Kong for a week as part of his 32000 miles round the world factfinding trip. During his stay, he spent time at the Sik Yuen rubber shoe factory and attended the Duke of Edinburgh Awards (now HK Award for Young People) ceremony at the Governor’s house. In the late 1960s and early 1970s, rubber shoe factories in HK shut down one by one due to various internal and external factors and Sik Yuen as one of the last players standing also closed its plant in around 1973. As of the late 1970s, Sik Yuen still listed its offices at Connaught Centre (now Jardine House) but by then Sir Chau was handicapped by a stroke and the Pong family was busy with their other industrial venture – Shiu Wing Steel. The 1970s saw the decline of Dunlop thanks to a disastrous tie-up with Pirelli in the tire business and the oil crisis and the firm was acquired by BTR in 1985 and the Dunlop boots brand was acquired by Hevea in 1995. As a firm, Sik Yuen Ltd was dissolved in 2002. D.Y. Pong (centre) and his wife Hong Siu-chu (left of Pong) showing Governor Maclehose (left of Hong) the Shiu Wing Steel plant in the 1970s. This article was first posted on 24th August 2018.